Poppy seed salad dressing poses two major concerns for consumers. First, it contains fats and sugars. Depending on your health concerns, you may need to closely monitor your consumption of these. Second, the poppy seeds used in food preparation and flavoring contain opiates, chemicals from which certain drugs are derived. Poppyseed dressing contains saturated fatty acids -- 2 grams per 2-tablespoon serving. The American Heart Association warns that consumption of saturated fats raises your blood cholesterol level. Raising those levels too high increases your risk of heart disease and stroke. The AHA recommends that no more than 7 percent of your daily caloric intake come from saturated fats. Poppyseed dressing also contains 308 milligrams of sodium -- roughly one-fifth of your recommended daily limit -- and 8 grams of sugar, which contributes to weight gain. Despite its drawbacks, poppyseed dressing has some positive effects on your body. It offers a significant amount of vitamin K, a nutrient that your body needs to form blood clots and maintain healthy bone tissue. The dressing also offers unsaturated fat, at 8.4 grams per serving. These healthy fats improve your blood cholesterol levels and protect against heart disease. They also serve as rich sources of energy to fuel your active lifestyle. 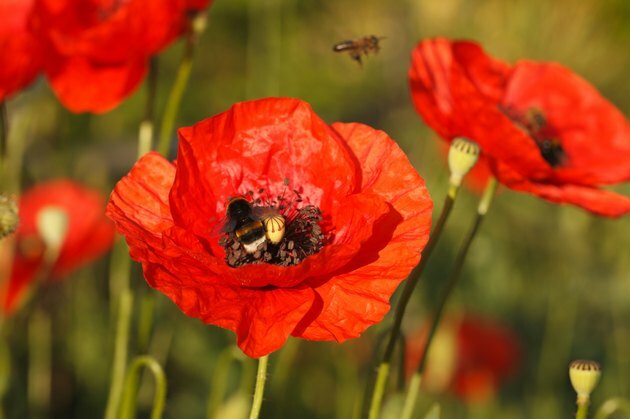 The poppy seeds used in food production come from the same plant from which opiate drugs such as codeine, morphine and heroin are derived: Papaver somniferum. When you consume poppy seed dressing, you are consuming a small amount of opiates. The single tablespoon of poppy seeds therein isn't enough to cause intoxication. The 1/14 tablespoon of poppy seeds in your single serving of dressing may, however, be enough to show up on a drug test if you underwent urinalysis within the next two to five days. Barbara Mikkelson cites four cases where people lost jobs or job offers due to poppy seeds in their food affecting their drug screenings. Mikkelson reports that some agencies now require a higher level of opiates in order to eliminate poppy seed-related false positives. Nevertheless, your safest bet is to abstain from poppy seeds in your food for at least two days before a scheduled drug test -- or to abstain entirely if your employer subjects you to random drug screening. How Do I Make Vinegar & Olive Oil Dressing?